What's included within our prices? We've divided all of our products into three distinct delivery 'bands'. The delivery band for each item can be found on its product page. Maps shown are for illustrative purposes only. Please refer to the information below for full details. Products that are classed under Band A are typically smaller, lighter items that can be sent using standard post. Delivery to addresses anywhere within the UK is included in the advertised price of these products. Items within Band B are normally larger products that are dispatched using carriers, or direct from the manufacturer. 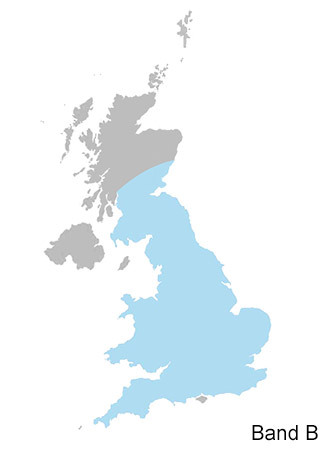 Products in this band include delivery within mainland Great Britain but exclude the postcode areas below. If you require delivery to addresses within the above post code areas, please contact our sales office and we will happily calculate a delivery quote for you. Products that require installation, construction or assembly upon delivery, including cricket scoreboxes and sightscreens can only be delivered within a 125 mile radius of Tur Langton, Leicestershire for the advertised price. Deliveries beyond this distance are subject to a surcharge. Any products that may be subject to a delivery/installation surcharge will have information shown on their relevant product page. If you require delivery beyond this distance, we will contact you to advise of the surcharge before proceeding with your order. Occasionally, orders will contain items that fall into different delivery bands. We endeavour to minimise the number of deliveries for your convenience, however this may lead to a slower than advertised delivery time for some items within your order. If your order contains an item that would attract a surcharge due to your delivery address, we will contact you prior to processing your order. Certain items are subject to a specified minimum quantity. Minimum quantities will be shown on the product information page and/or checkout when ordering. sportsequip despatch the majority of goods by 3 day carrier, i.e. those that aim to deliver within 3 working days of collection and require a signature upon delivery. We also despatch some small items by standard post. Please note that the carriers and delivery services we use will usually deliver during the working day. If it is unlikely that anyone will be available to sign for your order you may find it easier to give an alternative or work address. Large items - e.g. football and rugby goal posts, cricket cages, cricket sightscreens, cricket scoreboxes, fitness and physical training trails, playground surfacing and Compliant tiles may require special delivery arrangements or may require manufacturing to order. These may take up to 30 days or occasionally longer to despatch, in which case we will liaise with you and keep you fully advised. Many of our goods are delivered on large lorries. Any delivery access restrictions must be advised to us at the time of ordering. Any special arrangements required because of limited access are subject to extra cost. Deliveries are to agreed addresses only. Carriers drivers cannot be expected to exceed manual handling regulations. Therefore it is always the customers' responsibility to offload goods from lorries, including arranging for mechanical means if appropriate. Please check your goods carefully upon delivery for any signs of possible damage before you sign to say that you have received the goods in good condition. If you find the contents have been damaged, we recommend that you write 'Damaged' above your signature. If you are unable to check the item before signing, you can write 'Unchecked' above your signature. This is to ensure that a claim can be made against the courier company if necessary. sportsequip accept no liability for any consequence arising as a result of any instruction to deliver goods without signature.